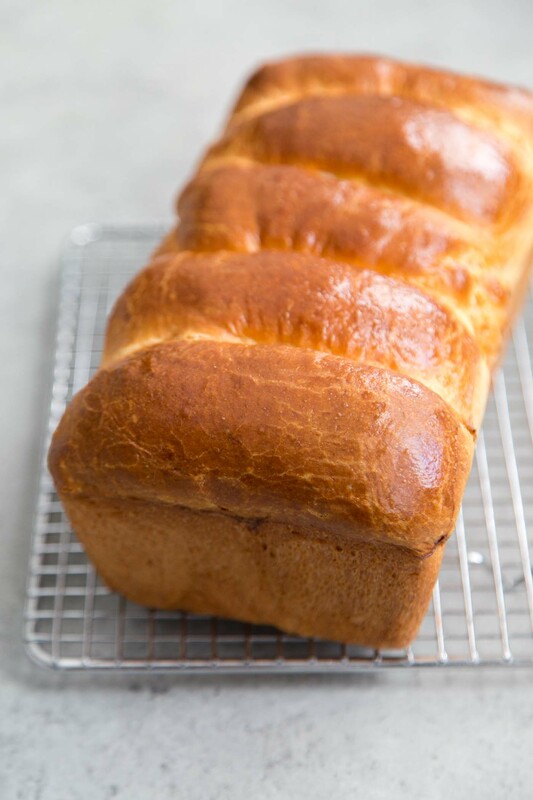 This brioche recipe was first posted on Recipe Girl. There is something magical about brioche. 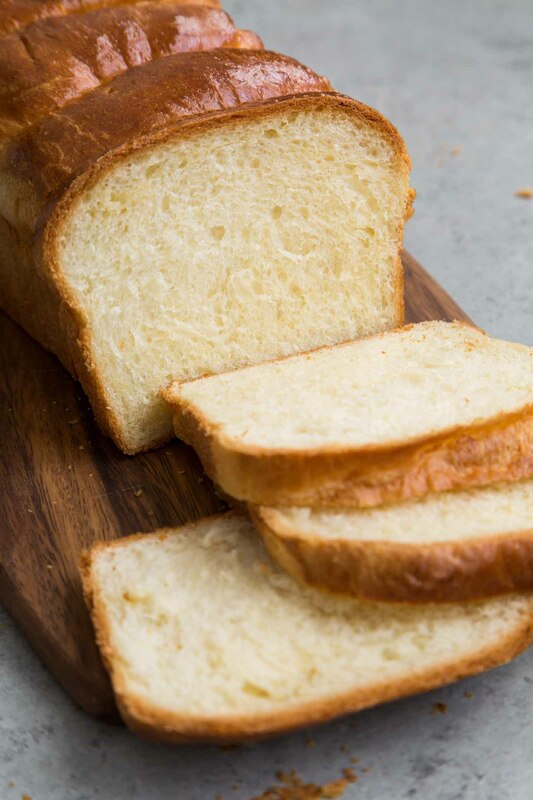 The combination of butter, eggs, and flour come together to create a soft, fluffy, and flavorful bread that is perfect for both sweet and savory applications. It’s great for French toast, Croque Madame (or Croque Monsieur), bostock, and more. While many bakeries and supermarkets sell brioche loafs, I find it super rewarding to make brioche from scratch at home. 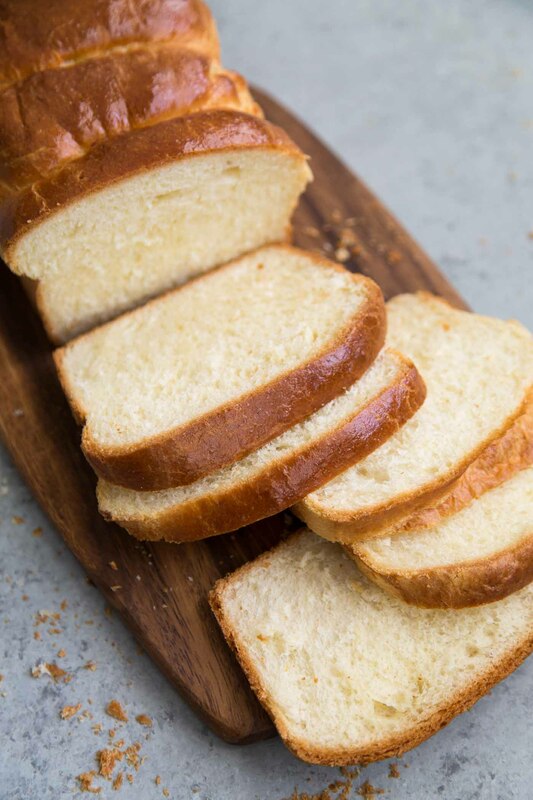 Brioche is a classic French yeasted bread known for it’s high egg and butter content. It’s use of butter and eggs lends to it’s pale yellow crumb and thin golden brown, shiny crust. Brioche can be shaped as a rectagular loaf, round boule, or in it’s most recognizable form- brioche à tête (a fluted muffin like roll topped with a smaller ball (head) on top). Although a bit time consuming to make, it’s a rather simple process. Much of the “time” is spent allowing the dough to rest and rise. With the help of a stand mixer, creating the brioche dough is quite easy. And if you are putting in the effort to make one loaf, you might as well double the recipe and make two loaves. The baked and cooled extra loaf can be wrapped tightly in plastic wrap and stored in the freezer for a month. What can you use brioche for? Brioche is essential for a classic Croque Madame (or Croque Monsieur). But in my opinion, brioche slices makes for THE best BLT. The salty, crunchy bacon with the sweet, juicy sliced tomatoes held together with the buttery brioche is pure heaven. Interested in other enriched doughs? Check out: Japanese milk bread, Filipino Pandesal, Chocolate Babka. In the bowl of a stand mixer, dissolve yeast and sugar in warm water. Stir to combine and allow to sit for 5 to 7 minutes. The mixture will bubble and smell like beer once the yeast has activated. Whisk in eggs until thoroughly combined. Attach dough hook to stand mixer. Add salt and 2 cups flour to mixing bowl. Start the mixer on low speed until the dough begins to come together, about 2 minutes. The dough should look like a shaggy mess. Increase speed to medium and add softened butter one tablespoon at a time. Mixture will be very sticky. Add remaining 2 tablespoons of flour. Continue to mix for another 3 minutes until dough is shiny and smooth. Stop mixer and cover bowl with plastic wrap or kitchen towel. Allow dough to sit for 15 minutes. Mix on medium speed for another 5 minutes. At this point, the dough will be quite sticky. Do not add additional flour. Use a spatula or dough scraper to remove sticky dough from mixing bowl. Transfer dough to a well greased large bowl. Cover with plastic wrap or kitchen towel. Allow dough to rise at room temperature for one hour. Grease a 9x5-inch loaf pan. Punch dough chilled dough. Divide dough into 5 equal portions. Working with one portion at a time, roll dough into a 5-inch square. Using the heels of your palms, gently flatten and stretch the dough to the desired size. 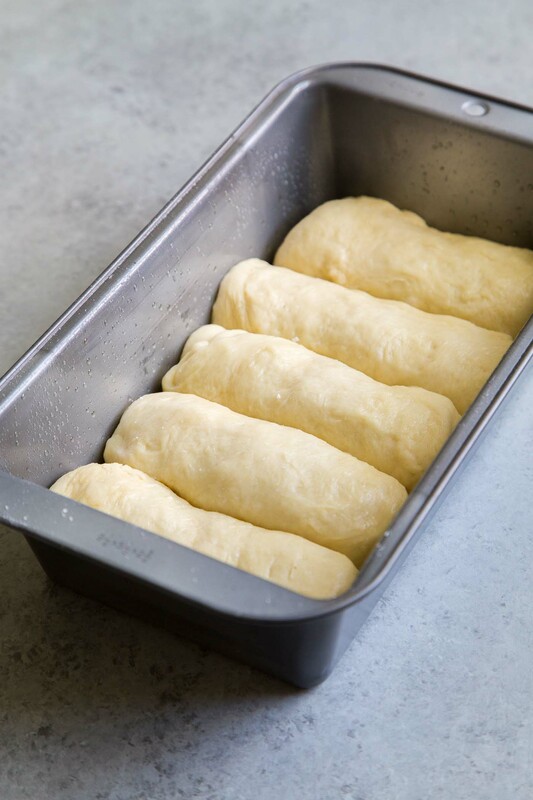 Roll dough into a log and place seam side down in prepared loaf pan. Repeat with remaining portions of dough. Loosely cover dough with plastic wrap or kitchen towel and allow dough to rest at room temperature. Leave dough undisturbed until dough reaches the top of loaf pan. This will take anywhere from 90 minutes to 2 hours depending on room temperature and humidity. Preheat oven to 350 degrees F. Mix egg wash by whisking together egg, salt, and water until smooth. Remove plastic wrap and lightly brush egg wash over the top of bread loaf. Bake bread for 35 to 45 minutes, rotating pan midway through baking. The finished bread loaf should be golden brown on top and the internal temperature of the bread should register at least 200 degrees F on an instant read kitchen thermometer. Allow bread to cool in pan for 10 minutes. Remove bread from pan and allow to cool to room temperature on wire rack. Once bread has cooled, use a serrated knife to slice. Store cooled bread in an airtight container at room temperature for up to 4 days. Overnight chilling of dough aids in the flavor development. 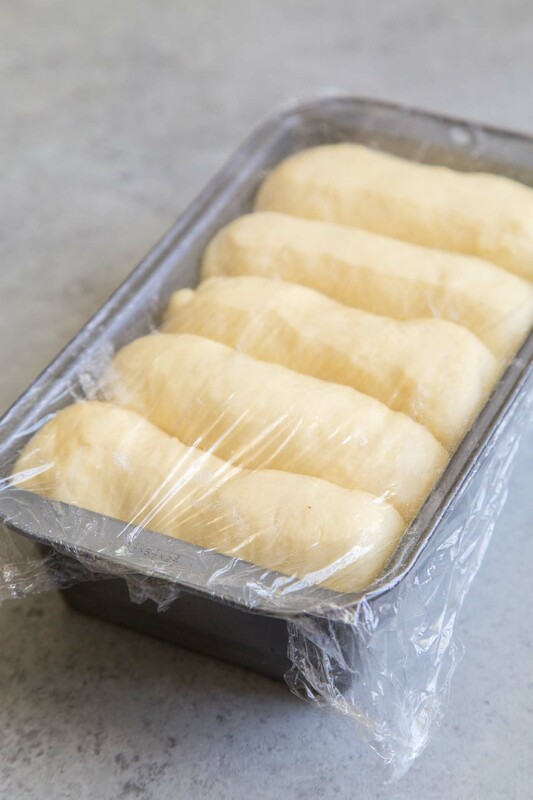 Cooled brioche loaf can be tightly covered in plastic wrap and stored in the freezer for up to a month. Defrost at room temperature. Can this bread rest in my fridge for longer than 12 hours? Will it be okay for 16 hours? Yes, 16 hours should be fine. As you get closer to 20-24 hours, the dough will overproof and that may result with bread that collapses during baking. Would it make a difference if i used bread yeast instead of active dry yeast? Hi Daya. I’m not sure what you mean by “bread yeast.” While this recipe uses dry active yeast, you can also adjust it to use instant (rapid-rise) yeast or fresh yeast. I never leave comments on recipes, but WOW!!! I just took it out of he over, and it smells, looks, and tastes amazing!! Thank you so much for sharing!! This bread sounds so good and I love making bread. But unfortunately I don’t have a stand mixer. I feel slightly left out. No brioche for me.